Early church services were held in the Green Mansion and in the chapel annex of Columbia Hall. In 1913 the cornerstone was laid for St. Joseph’s Catholic Church, designed by architect Guido Beck. The two story edifice was constructed of Stone City stone furnished by the two Irish immigrants, Green and Ronen and Henry Dearborn, owners of the quarries. The stained glass windows were imported from Munich, Germany. The white marble altar came from Carrara, Italy, donated by the Green Family in memory of their son who died in a tragic railroad accident. A ten foot tall stone fireplace was built in the basement. Because of its hillside location and unique architecture, it stands as a beautiful landmark today. 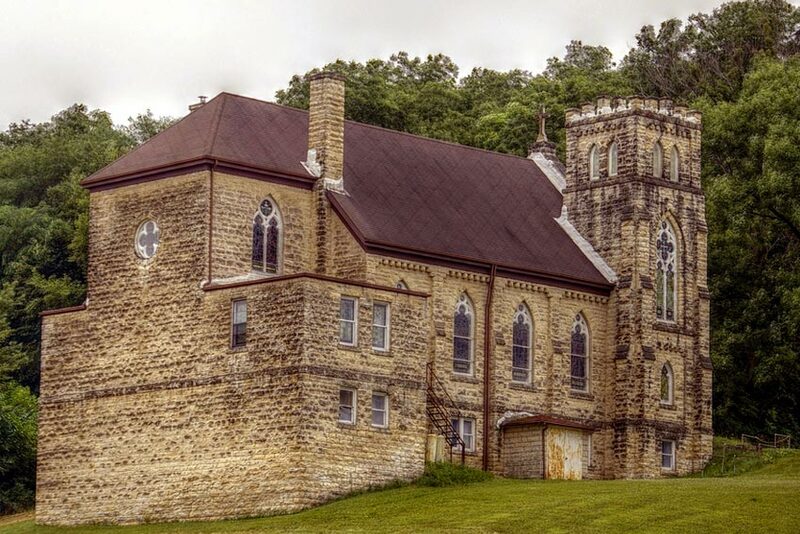 The church became inactive in 1992 and later it was declared an oratory parish by the Archdiocese of Dubuque.